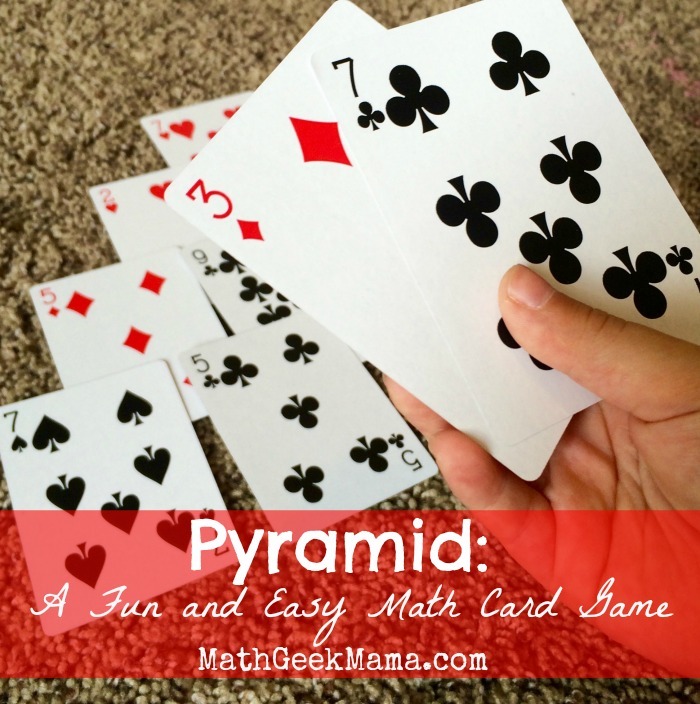 Pyramid: Fun and Easy Math Card Game! What kid doesn’t love to play games? 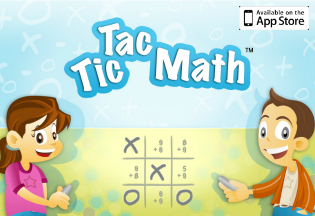 Any time you can turn math practice into a fun, engaging and competitive game is a win! Especially when all you need to play that game is a regular deck of playing cards ! 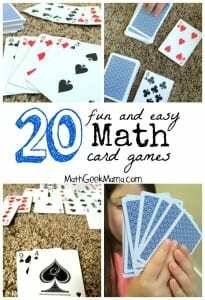 🙂 This math card game to make ten is fun and simple! I read about this game recently in the book Games for Math by Peggy Kaye. 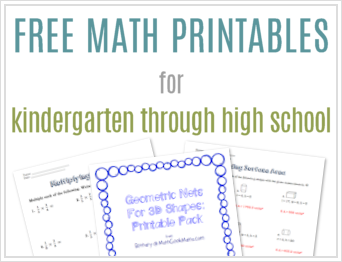 This book includes dozens of games to play to make learning math in grades K-3 fun! The game I’m sharing today is called Pyramid, and helps reinforce addition skills, and learning the number bonds of ten. I think knowing how to “make ten” is an especially important skill for early learners, because it is a helpful strategy to use when adding larger numbers, estimating, counting change and more. Pyramid is a solitaire style game, but can be played by more than one player by keeping score in each “round.” It reminds me of those little pyramid games on the table at Cracker Barrel where you have to try and remove all but one pin. (Although there is no jumping involved. Just trying to get rid of as many of the cards as you can). First, remove all face cards (except Ace, which will represent the number one) and jokers from your deck of cards and shuffle well. 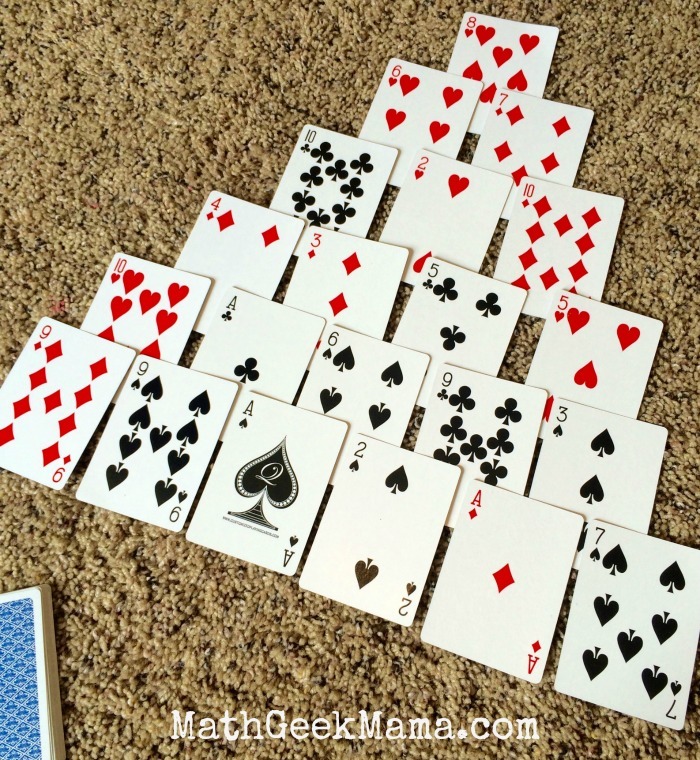 Then arrange your cards into a Pyramid with 6 rows, as shown below, with each row slightly overlapping the previous row. 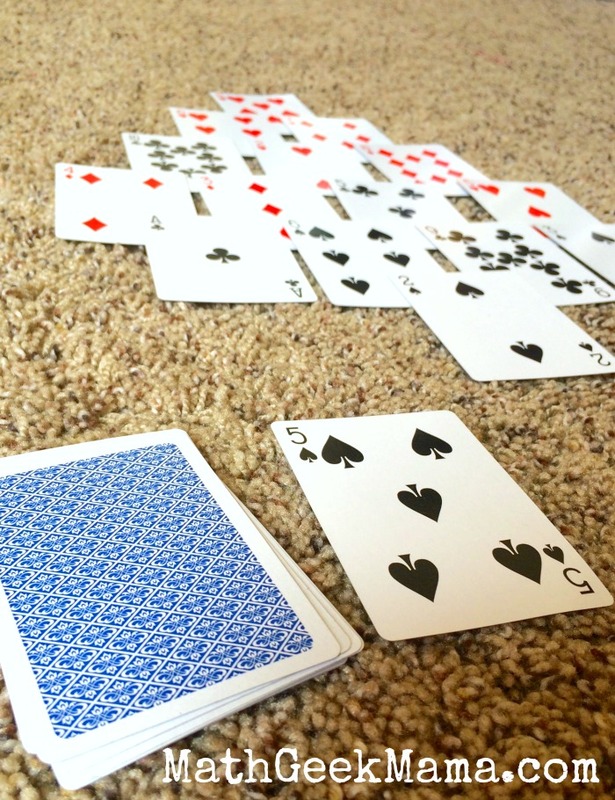 Place remaining cards in a deck, face down, off to the side. The goal is to remove cards in the pyramid by “making ten” with two cards. (Or removing a ten card, as it is already equal to ten). However, you can only remove cards that are completely uncovered. Therefore, at the start of the game, you can only use the bottom row of the pyramid to make ten. 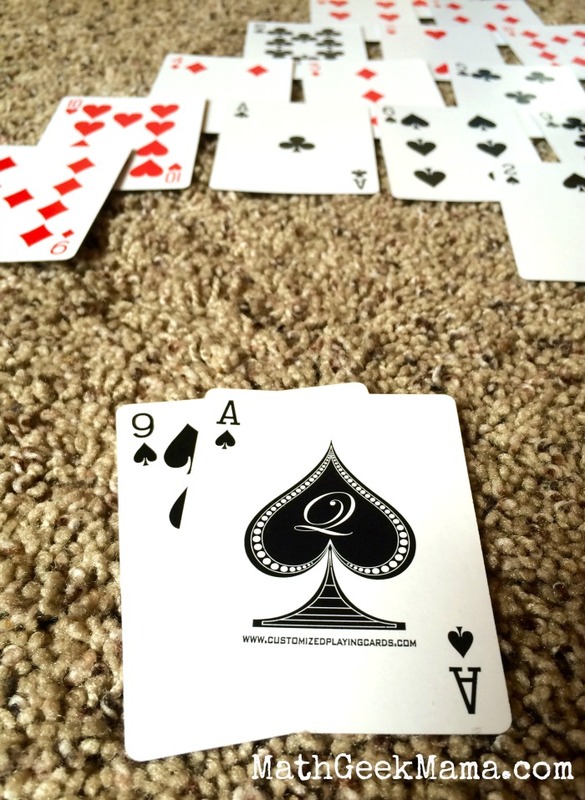 So for example, in the game shown above, I was able to remove a nine and an ace to make ten. There were actually two nines and two aces in the bottom row, so I did this twice. Then, I was able to remove the ten in the next row, because it had been completely uncovered. At this point, all that was available was an ace, a two and a seven. No two cards remaining could make ten, but the game is not over! Remember the deck of cards off to the side? These can be drawn from to try and find a needed card. So when there is no other option in your pyramid, draw a card from the deck. Continue to draw until you can make another ten. Remove those cards, and continue to play in the same way. If you make it through the entire deck, you can flip them over and begin drawing again. The game is over when you can no longer remove cards from your pyramid. Once you are stuck and can no longer remove any more cards, add all the remaining cards to determine your score. The person with the smallest number wins! I could do nothing else, because I needed a seven to make ten, but the only remaining seven was further up in my pyramid. Therefore, my score was 33. (This is not very good, in case you were wondering!). My daughter, however, was able to remove all but one card in her pyramid and ended up with a score of 7. She even noticed at the start of my round that no matter what, she was going to win! Why? Well, as you can see in the pictures, the very top card in my pyramid is 8. So even if I had been able to remove all but one, she still would have won. 😉 She’s a clever one! I look forward to playing this with both she and her brother, and maybe playing multiple rounds to find a winner! Have a younger one? 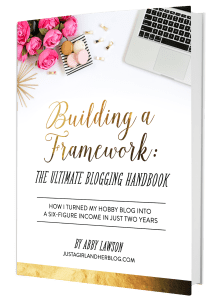 To make sure this is fun and not discouraging, you might consider giving an “equation sheet” with all the possible ways to make ten for little ones to use when playing. It will still help them learn and recognize the number bonds, while having fun playing the game! Love this game? 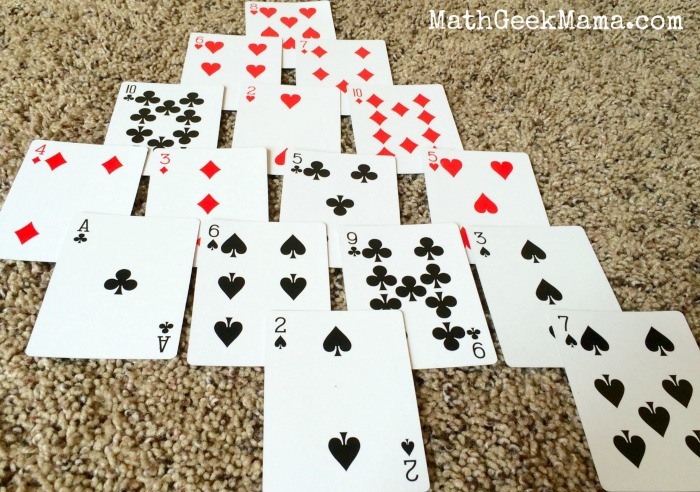 Want even MORE fun card games that teach your kids important math skills? 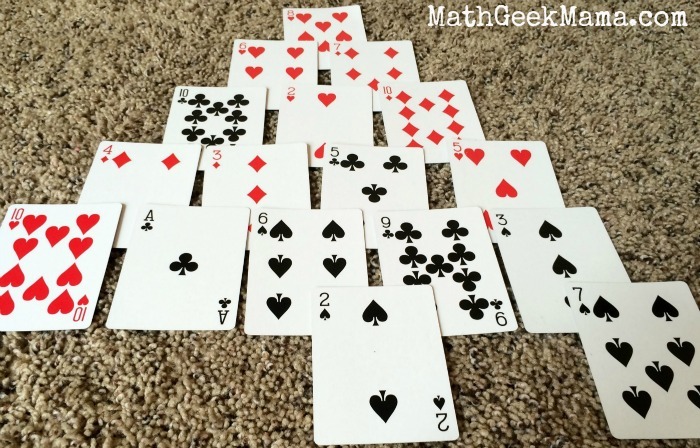 Check out this post of the 20 BEST math card games! That sounds like such a fun and easy game to play with kids. I love card games. Thanks for teaching me something new! I’m going to try it with my kindergartner-to-be. AARP games has pyramid to play online to make thirteen once your learner is confident with making ten. King is 13, queen is 12, and so on. I really like your idea of having an equation sheet to get started. As an adult beginning to play pyramid, the face cards slowed me down and it was amazing how the unusual thirteen threw me off for a while untill I played regularly. 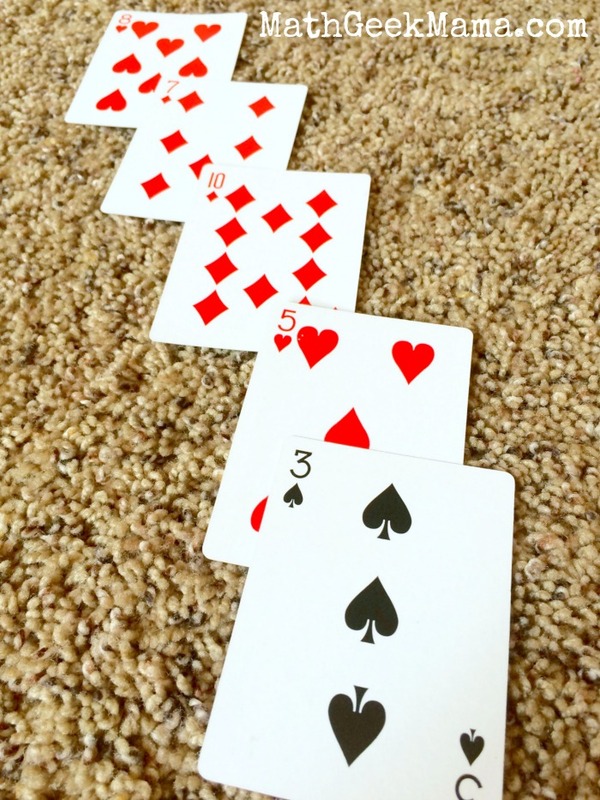 Playing with a real deck of cards means you can decide what number bond family you want to work on too, adjusting numbers of rows of cards as needed. I can’t understand how you would have cards leftover if you always draw until you find a card to make 10. Also, following that method, with 8 at the top, wouldn’t you just draw from the deck until you find a 2? I’m missing some limiting rule to this game. Hey Sarah! Sorry for the confusion. You don’t keep going through all the cards. Once I pair of cards is removed, it’s set aside. You can’t reuse those cards. Hope that makes sense! Played this with my daughter. We took turns to clear as many 10s as we could. If you couldn’t go you could instead turn over a new card and match it with something (including the one at the top of the discard pile). You could either win by having the most 10s at the end, or by being the one to clear the last card if that was possible. Made for some good competitiveness when you could swan in and match a ten the other person had missed.Thanks for the games. Aww, I love this so much!! Thank you for sharing, I’m so glad this was a fun and engaging game for your students!